There is an option to integrate sound fonts, but it is impossible to use them, because there is no FluidSynth option. Is this disabled by default? 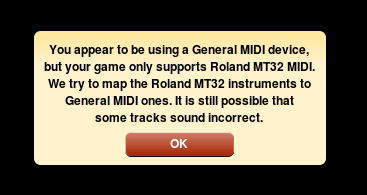 On PC I get a pop up telling me that it's trying to map the Roland MT32 to general MIDI ones. My device is a ZTE Axon 7 and would be really nice to use the full range of those stereo front speakers.